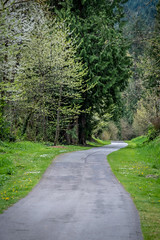 King County Parks blogging about our 200 parks, 175 miles of trails, and 28,000 acres of open space. Spring brings more people to our regional trails. Make sure you know how to be a good trail visitor. Check out what our seasoned Parks’ crew is up to as crazy winter weather continues! Ever wonder what makes a regional trail, a regional trail? Ever wonder what makes a regional trail, a regional trail? Find out in this interactive exploration! Don’t park that bike for the winter! Don’t let the dark get you down. Don’t let the wet keep you from staying healthy and happy. Hop on your bike and go for a ride!